We take great pleasure and feels esteemed in welcoming the contributors over the globe to attend “22nd International Conference on Graphene, Carbon Nanotubes, and Nanostructures” is to be held at Berlin, Germany during September 17-18, 2018, which includes prompt keynote presentations, Oral Talks, Poster presentations and Exhibitions. 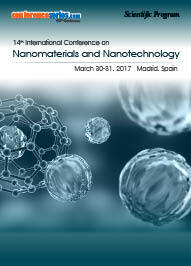 Conference is organized around the theme: “Launching Carbon into the World of Nanotechnology”. Conferenceseries organizes a conference series of 3000+ Global Events with over 600+ Conferences, 1200+ Symposiums and 1200+ Workshops in USA, Europe & Asia with support from 1000 more scientific societies and publishes 700+ Open access journals which contain over 30000 eminent personalities, reputed scientists as editorial board members. It aims in bringing together world-class professors, researchers, scientists and students across the world to discuss about the current developments that are taking place in the field of Carbon. Graphene & Carbon Materials are designed in such a way to provide diverse and current research that will provide an in-depth analysis in that field. 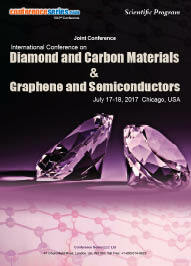 The 22nd International Conference on Graphene, Carbon Nanotubes, and Nanostructures is organized with a theme of “Launching Carbon into the World of Nanotechnology” with an objective to encourage young minds to overcome the challenges in the research field of Material Science by providing an opportunity to meet the experts. Chemical functionalization of graphene enables the material to be processed by solvent-assisted techniques, such as layer by layer assembly, spin coating, and filtration. Hexagonal boron nitride is electrically insulating, combined with graphene and other 2D materials to make heterostructure devices. The two-dimensional graphene sheet structures for field emission of electrons due to the carrier mobility and electron mass. The field emitter by using multi-layered graphene nanostructure, the graphitic structure of pristine graphene and the carbon nanotube is the driving force of their interaction. The combination of graphene with carbon nanotubes to produced hybrids increased electrical conductivity, mechanical properties, and high surface area. 4th International Conference and Expo on Ceramics and Composite Materials, May 14-15, 2018, Rome, Italy; 7th International conference on Smart Materials and Structures, July 2-3, 2018, Vienna, Austria;19th World Congress on Materials Science and Engineering, June 11-13, 2018, Barcelona, Spain; 2nd International Conference and Expo on Diamond, Graphite & Carbon Materials, April 16-17, 2018 Las Vegas, Nevada, USA; 2nd International Conference and Expo on Graphene & Semiconductors, April 16-17, 2018, Las Vegas, Nevada, USA; 5th World Congress on Smart and Emerging Materials, April 19-20, 2018 Dubai, UAE; AEM2018: 5th International Conference on Advanced Graphene Materials, September 10-12, 2018 , England, UK; International Conference and Expo on Graphene & Semiconductors 2018, April 16-17, 2018, Las Vegas, USA; 4th Global Nanotechnology Congress and Expo, April 16-18, 2018, Dubai, UAE. 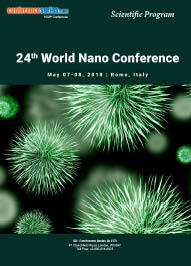 Asia-Pacific: Asian Nanoscience and Nanotechnology Association, International Association of Nanotechnology, Asian Society for Precision Engineering and Nanotechnology, National Nanotechnology center, Global Nanotechnology Network. The best way to synthesize graphene is by the process of the chemical method. The Mechanical exfoliation method is possibly the technique to attain single and few-layered graphene products from natural graphite by recurrent peeling/exfoliation. Chemical vapor deposition method has procedures for making thin continuous films with thickness control in micro-electronics. Plasma Enhanced Chemical Vapor Deposition (PECVD) synthesize larger part of graphene on copper foils using spin-coated PMMA films. Graphene heterostructures are synthesized on cobalt substrates by means of the molecular beam epitaxial growth. 23rd International Conference on Advanced Materials, June 20-21, 2018, Oslo, Norway; 20th International Conference on Advanced Energy Materials and Research, August 13-14, 2018, Dublin, Ireland; 4th International Conference and Expo on Ceramics and Composite Materials, May 14-15, 2018, Rome, Italy; 18th International Conference and Exhibition on Materials Science and Engineering, May 28-30, 2018, Osaka, Japan; 20th International Conference on Emerging Materials and Nanotechnology, June 25-26, 2018, Vancouver, British Columbia, Canada; 2nd International Conference on Energy Materials and Fuel Cell Research, August 27-28, 2018, Boston, Massachusetts, USA; IDTechEx Graphene & 2D Materials 2018, April 11-12, 2018, Berlin, Germany ; Materials Science and Graphene Technology 2018, April 9-11, 2018, Dubai, UAE; 8th Edition of the largest European Conference & Exhibition in Graphene and 2D Materials, June 26-29, 2018, Dresden, Germany. Graphene enhanced lithium-ion batteries could be more beneficial for advanced energy usage applications such as in smartphones, laptops and tablet PCs. Graphene is cost-effective, flexible and extremely efficient for photovoltaics devices due to its outstanding electron-transport properties and carrier mobility. Single or few layered graphenes with less agglomeration show higher surface area and an improved supercapacitor. In hydrogen storage, hydrogen plays an important role in energy carriers. As a fuel, it is lightweight, comprises high energy density and produces no harmful chemical by-products, hydrogen considered as a green energy. Graphene based composites are currently popularized on an enormous scale. These graphene-based composites are increasing constantly, and they are available in the market for their use as tennis rackets, to bikes, to skis. The execution of such materials is not almost identical to that of immaculate graphene sheets, that are measured at the nanoscale, which excellently go around settled materials, for example, steel, silicon, or copper. A significant description behind this discrepancy in properties is that it is not yet entirely seen how two-dimensional (2D) - based composites work at the nanoscale level (mechanical, electrical, and so on.) when they are fused into a mass material. 20th International Conference on Advanced Energy Materials and Research, August 13-14, 2018, Dublin, Ireland; 4th International Conference and Expo on Ceramics and Composite Materials, May 14-15, 2018, Rome, Italy; 7th International conference on Smart Materials and Structures, July 2-3, 2018, Vienna, Austria; 19th World Congress on Materials Science and Engineering, June 11-13, 2018, Barcelona, Spain; 2nd International Conference and Expo on Diamond, Graphite & Carbon Materials, April 16-17, 2018 Las Vegas, Nevada, USA; 2nd International Conference and Expo on Graphene & Semiconductors, April 16-17, 2018, Las Vegas, Nevada, USA; 5th World Congress on Smart and Emerging Materials, April 19-20, 2018 Dubai, UAE; IDTechEx Graphene & 2D Materials 2018, April 11-12, 2018, Berlin, Germany ; Materials Science and Graphene Technology 2018, April 9-11, 2018, Dubai, UAE; 8th Edition of the largest European Conference & Exhibition in Graphene and 2D Materials, June 26-29, 2018, Dresden, Germany. 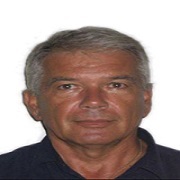 Europe: Swedish Composites Society, British Composites Society, European Composites Society, European Society for Composite Materials, Italian Composites Society, German Composites Society. 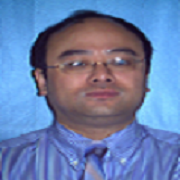 Asia: Chinese Composites Society, China, Australian Composites Society, Australia, Composites Society of Japan, Composites Society of Thailand, Composites society of Korea. Graphene has been extensively exploited as a part of numerous applications in the current decade because of its excellent properties, that include extensive surface-to-volume proportion, exciting optical properties, outstanding electrical conductivity, high bearer portability, high transporter thickness, high warm conductivity, room temperature Hall impact, ambipolar field-impact attributes, high flag to-clamor proportion, and importantly high mechanical quality. It is a two-dimensional (2D) planar sheet of sp2-fortified carbon molecules stuffed thickly in a honeycomb-like cross section. The huge scale engineering of graphene is by the help of Concoction Vapor Affidavit (CVD). A few substance alterations, biomolecular immobilization, and Nanocomposite arrangement techniques have also been formed. 23rd International Conference on Advanced Materials, June 20-21, 2018, Oslo, Norway; 20th International Conference on Advanced Energy Materials and Research, August 13-14, 2018, Dublin, Ireland; 4th International Conference and Expo on Ceramics and Composite Materials, May 14-15, 2018, Rome, Italy; 18th International Conference and Exhibition on Materials Science and Engineering, May 28-30, 2018, Osaka, Japan; 20th International Conference on Emerging Materials and Nanotechnology, June 25-26, 2018, Vancouver, British Columbia, Canada; 2nd International Conference on Energy Materials and Fuel Cell Research, August 27-28, 2018, Boston, Massachusetts, USA; AEM2018: 5th International Conference on Advanced Graphene Materials, September 10-12, 2018 , England, UK; International Conference and Expo on Graphene & Semiconductors 2018, April 16-17, 2018, Las Vegas, USA; 4th Global Nanotechnology Congress and Expo, April 16-18, 2018, Dubai, UAE. Europe: National Graphene Institute, European Materials Research Society, International Association of Advanced Materials, European Science Foundation. 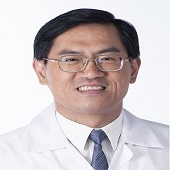 Asia-Pacific: International Association of Advanced Materials, Materials Research Society of Singapore, The Association of East Asian Research Universities, Australian Composite Structures Society, Chinese Society for Composite Materials, Japan Society for Composite Materials, Chinese Society for Metals. Graphitated Carbon Nanotubes are the novel hybrid materials that combine graphitic foliates produced with sidewalls like bamboo style Carbon Nanotubes (CNTs). It has a high surface area with a 3D outline of CNTs joined with high edge density of graphene. Chemical modification of carbon nanotubes (CNT) are covalent and non-covalent alterations owing to their hydrophobic nature and expand their adhesion to a bulk polymer via chemical bonding. Applications of the carbon nanotubes (CNT) include composite fiber, cranks, baseball bats, Microscope probes, supercapacitor, and useful in the fields of tissue engineering, energy storage etc. Nanotubes are characterized as single-walled and multi-walled nanotubes with associated structures. 7th International conference on Smart Materials and Structures, July 2-3, 2018, Vienna, Austria; 19th World Congress on Materials Science and Engineering, June 11-13, 2018, Barcelona, Spain; 23rd International Conference on Advanced Materials, June 20-21, 2018, Oslo, Norway; 30th International Conference on Materials Chemistry & Science, August 27-28, 2018, Toronto, Ontario, Canada; 20th International Conference on Advanced Materials Science & Nano Technology, August 27-29, 2018, Dubai, UAE; 21st International Conference on Advanced Materials & Nanotechnology, September 04-06, 2018, Zürich, Switzerland; AEM2018: 5th International Conference on Advanced Graphene Materials, September 10-12, 2018 , England, UK; International Conference and Expo on Graphene & Semiconductors 2018, April 16-17, 2018, Las Vegas, USA; 4th Global Nanotechnology Congress and Expo, April 16-18, 2018, Dubai, UAE. By alloying multiple compounds, some semiconductor materials are tunable that results in ternary, quaternary compositions. Applications of semiconductors materials are optoelectronic, solar cells, Nanophotonics, and quantum optics. Fabrication of cellulose Nano-structures via Nano Synthesis is a direct conversion of TMSC layers into cellulose via a Nano-sized focused electron beam as used in scanning electron microscopes. 20th International Conference on Advanced Energy Materials and Research, August 13-14, 2018, Dublin, Ireland; 4th International Conference and Expo on Ceramics and Composite Materials, May 14-15, 2018, Rome, Italy; 7th International conference on Smart Materials and Structures, July 2-3, 2018, Vienna, Austria; 2nd International Conference and Expo on Diamond, Graphite & Carbon Materials, April 16-17, 2018 Las Vegas, Nevada, USA; 2nd International Conference and Expo on Graphene & Semiconductors, April 16-17, 2018, Las Vegas, Nevada, USA; 5th World Congress on Smart and Emerging Materials, April 19-20, 2018 Dubai, UAE; 4th Global Nanotechnology Congress and Expo, April 16-18, 2018, Dubai, UAE, IDTechEx Graphene & 2D Materials 2018, April 11-12, 2018, Berlin, Germany ; Materials Science and Graphene Technology 2018, April 9-11, 2018, Dubai, UAE; 8th Edition of the largest European Conference & Exhibition in Graphene and 2D Materials, June 26-29, 2018, Dresden, Germany. The initial two-dimensional (2D) material that was revealed is graphene during the year 2004. 2D Materials which are referred to as single-layer materials are the crystalline materials that involves only a single layer of atoms. Since the isolation of graphene, a huge research was carried out in segregating other 2D materials owing to their distinct features and their wide applications in photovoltaics, semiconductors, electrodes and water purification. Research on these materials has increased more hastily than that of graphene since 2010. The global marketplace for 2D materials is predictable to reach USD390 million within an era, generally for graphene in their applications as semiconductor materials, electronics, batteries and composites markets. 19th World Congress on Materials Science and Engineering, June 11-13, 2018, Barcelona, Spain; 23rd International Conference on Advanced Materials, June 20-21, 2018, Oslo, Norway; 20th International Conference on Advanced Energy Materials and Research, August 13-14, 2018, Dublin, Ireland; 30th International Conference on Materials Chemistry & Science, August 27-28, 2018, Toronto, Ontario, Canada; 20th International Conference on Advanced Materials Science & Nano Technology, August 27-29, 2018, Dubai, UAE; 21st International Conference on Advanced Materials & Nanotechnology, September 04-06, 2018, Zürich, Switzerland; AEM2018: 5th International Conference on Advanced Graphene Materials, September 10-12, 2018 , England, UK; International Conference and Expo on Graphene & Semiconductors 2018, April 16-17, 2018, Las Vegas, USA. Graphene based Nanomaterials have abundant promising applications in vitality associated zones. Graphene enhances both energy limit and charge rate in rechargeable batteries; Enacted graphene makes dominant supercapacitors for energy stockpiling. Graphene terminals are going to be the prominent methodology for creating sunlight-based cells that are economical, lightweight and adaptable. Likewise, the multifunctional graphene mats are promising substrates for synergist frameworks. The prominent energy associated areas where graphene will have an effect in sun-powered solar cells, supercapacitors, lithium-particle batteries, and catalysis for energy units. 4th International Conference and Expo on Ceramics and Composite Materials, May 14-15, 2018, Rome, Italy; 7th International conference on Smart Materials and Structures, July 2-3, 2018, Vienna, Austria; 19th World Congress on Materials Science and Engineering, June 11-13, 2018, Barcelona, Spain; 2nd International Conference and Expo on Diamond, Graphite & Carbon Materials, April 16-17, 2018 Las Vegas, Nevada, USA; 2nd International Conference and Expo on Graphene & Semiconductors, April 16-17, 2018, Las Vegas, Nevada, USA; 5th World Congress on Smart and Emerging Materials, April 19-20, 2018 Dubai, UAE; 4th Global Nanotechnology Congress and Expo, April 16-18, 2018, Dubai, UAE,; IDTechEx Graphene & 2D Materials 2018, April 11-12, 2018, Berlin, Germany. Carbon is one among those materials that can stick itself to its shape to a greater degree solid two-dimensional (2D) sheets. In this three-dimensional world, these sheets can be rolled and collapsed into several three-dimensional structures. The ball-formed fullerenes and the tube-shaped nanotubes are familiar among the three-dimensional (3D) structures. Other possible structures are carbon nanocones and Swiss cheddar like nanoporous carbon. 23rd International Conference on Advanced Materials, June 20-21, 2018, Oslo, Norway; 20th International Conference on Advanced Energy Materials and Research, August 13-14, 2018, Dublin, Ireland; 4th International Conference and Expo on Ceramics and Composite Materials, May 14-15, 2018, Rome, Italy; 20th International Conference on Advanced Materials Science & Nano Technology, August 27-29, 2018, Dubai, UAE; 21st International Conference on Advanced Materials & Nanotechnology, September 04-06, 2018, Zürich, Switzerland; Materials Science and Graphene Technology 2018, April 9-11, 2018, Dubai, UAE; 8th Edition of the largest European Conference & Exhibition in Graphene and 2D Materials, June 26-29, 2018, Dresden, Germany. Nanomaterials (Graphene, carbon nanotube & nanostructures) is an international, interdisciplinary journal which publishes articles covering both basic and applied research on Nanomaterials and related materials. Nanomaterials research takes a materials science-based approach to nanotechnology, leveraging advances in materials metrology and synthesis which have been developed in support of microfabrication research. Materials with structure at the nanoscale often have unique optical, electronic, or mechanical properties. Papers published cover all fundamental and technological aspects of synthesis, characterization, properties, devices and generic applications of these materials. The global carbon nanotubes market size is expected to reach 15.10 kilotons by 2022. In terms of value, the market size was USD 3.43 Billion in 2016, and is likely to reach USD 8.70 Billion by 2022, at a CAGR of 17.09% during 2017 to 2022. The demand for carbon nanotubes has been increasing rapidly in applications such as field emission displays, integrated circuits, hydrogen storage, lithium batteries, solar PV cells, fuel cells, drug delivery, and so on. Increasing commercialization; ramping up of installed capacities; and technological advancements to bring down prices, improve quality, and develop more advanced products are the trends in the carbon nanotubes market. Currently, R&D is being undertaken for capturing new applications, including food materials, glass ceramic, structural steel, agriculture, and hair color. The constant increase in feasibility of potential applications for carbon nanotubes will keep the demand ticking upwards during the forecast period. The carbon nanotubes market is segmented based on application into electronics & semiconductor, advanced materials, chemical & polymers, batteries & capacitors, energy, aerospace & defense, medical, and others. The electronics & semiconductor segment is expected to grow at the highest CAGR during the forecast period of 2017 to 2022. The CNTs offer unique electrical properties for building electronic devices such as field effect transistors and diodes. These are also used to form a p–n junction diode by polymer coating and chemical doping. Furthermore, CNT based diodes can potentially disperse heat out of the computer chips due to their unique thermal transmission properties. The Asia Pacific carbon nanotubes market is expected to grow at the highest CAGR during the forecast period, which can be attributed to the rising demand for carbon nanotubes from economies of the Asia Pacific region, including India, China, South Korea, Vietnam, Taiwan, and Singapore, among others. The robust demand in Asia Pacific is the major driving factor for the global carbon nanotubes market. China will lead the demand for carbon nanotubes due to its increased industrial production. 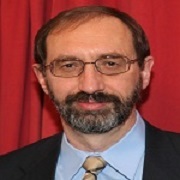 It is also among the largest consumers of carbon nanotubes at the global level. 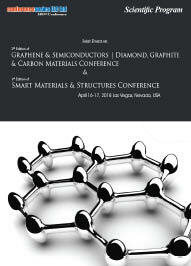 Graphene, Carbon Nanotubes, and Nanostructures 2018 International Conference is a premier forum to showcase the latest results in the science and technology of Graphene & carbon materials, with an emphasis on combination of graphene with carbon nanotubes as well fundamental physical and chemical concepts to applied research focusing on the next generation carbon-based devices.